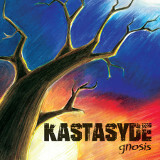 Independent metalcore outfit Kastasyde's new album ended up being a lot more melodic than I expected based on what I was reading about them, but I always liked that sort of thing, so I can't say I have a problem with that. Gnosis is a strong showing, an aggressive but thoughtful album with plenty of variety to hold the listener's interest that should have some crossover appeal to melodeath fans as well as more groove-oriented metalheads. The first few minutes of the album is what one would conventionally expect. Raw distorted guitars with a fast, clean attack pair with vocalist Jarrett Roberts' roared vocals, though partway through the guitar melodies start dualing in a manner more reminiscent of In Flames than Pantera (though I did catch some of the pinch-harmonic playing Dimebag loved to do so much), but thus far into Natural State, there were no surprises given what the band's billed as. Burial in the Sky is more melodic and contains substantially more atmosphere, though, and surprisingly, the title track, which is also the longest song on the album, stays clean for its first two minutes of marching beat -- and even then, afterwards, the guitars form more intertwining solos that twist back into one another and into the riffing like vines. In the Spiral is quieter, almost completely acoustic, and Roberts' vocals gives it a vibe similar to some of the Nirvana unplugged songs, but right after that we get its polar opposite, with furious thrashing that still leaves room for some excellent soloing as the guitar solo melodies play rounds with the bassline. This seeming compensation for slow songs by making the next part faster is repeated on the last track, Tiamat, which follows a very slow song with what sounds like it's going to be another slow, aimless sounding piece -- right up until it's a minute or so underway, when it positively explodes into riffing that's fast and chunky enough to make a lot of thrash seem slow and peaceful by comparison. When I picked Gnosis to listen to out of the list, my colleague Joel (who had heard them before) mentioned that they were pretty good and I'd probably like them. While I don't always agree with his band verdicts, this one was right on the money. Kastasyde delivers the goods here with a solid, competent album whose melodies only enhance the aggressive nature of their offering rather than diminishing it in the slightest.